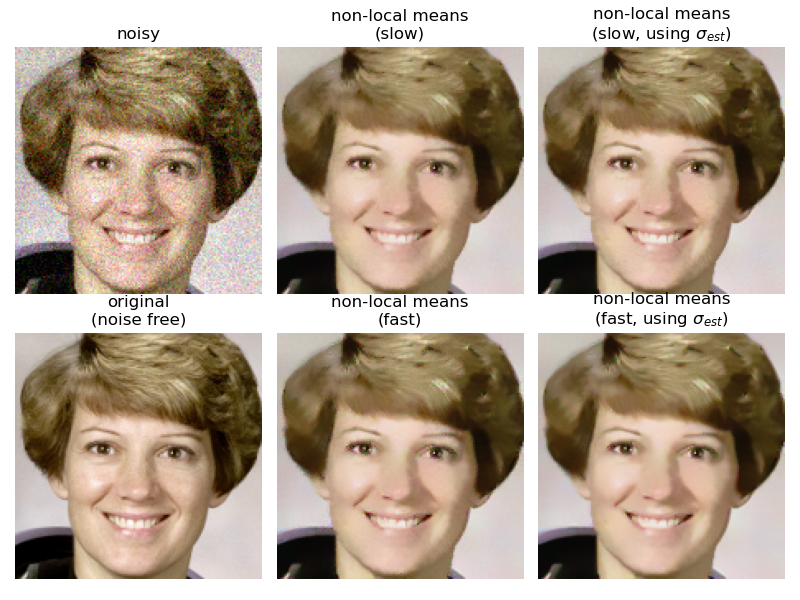 In this example, we denoise a detail of the astronaut image using the non-local means filter. The non-local means algorithm replaces the value of a pixel by an average of a selection of other pixels values: small patches centered on the other pixels are compared to the patch centered on the pixel of interest, and the average is performed only for pixels that have patches close to the current patch. As a result, this algorithm can restore well textures, that would be blurred by other denoising algorithm. When the fast_mode argument is False, a spatial Gaussian weighting is applied to the patches when computing patch distances. When fast_mode is True a faster algorithm employing uniform spatial weighting on the patches is applied. For either of these cases, if the noise standard deviation, sigma, is provided, the expected noise variance is subtracted out when computing patch distances. This can lead to a modest improvement in image quality. The estimate_sigma function can provide a good starting point for setting the h (and optionally, sigma) parameters for the non-local means algorithm. h is a constant that controls the decay in patch weights as a function of the distance between patches. Larger h allows more smoothing between disimilar patches. In this demo, h, was hand-tuned to give the approximate best-case performance of each variant.